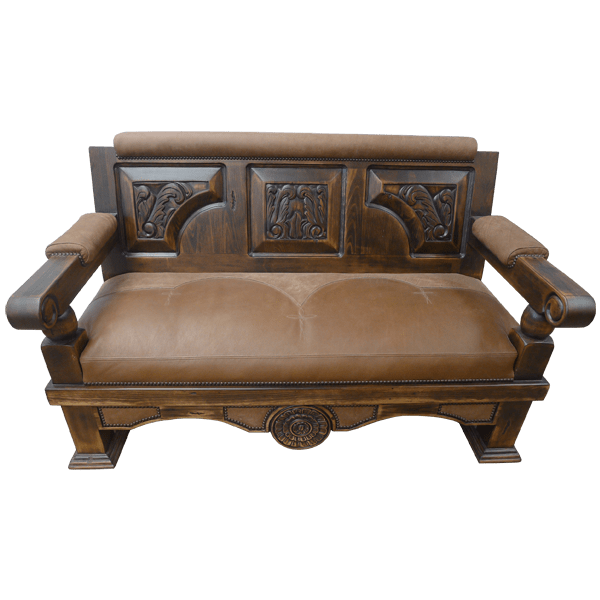 Bring elegance to your living room décor with this graceful, handcrafted, Western style bench. The bench has a rectangular seatback, and the padded top of the seatback is upholstered with beautiful, brown, full grain leather. The face of the setback is adorned with three, beveled, geometric panels, and each panel has exquisite, hand carved, floral and scroll design in its center. The wide, rectangular seat is partially upholstered with matching, brown, full grain leather. The remaining portion of the seat is upholstered with contrasting, full grain leather in a Western cut design. Hand sewn Spanish colonial style crosses also enhance the seat. The scrolled armrest are also partially upholstered in full grain leather. All of the leather is hand tacked to the solid wood frame with ornate, gilt nails. The bench has a front, curved apron, and the center of the apron is embellish with a hand carved, circular design, adorned with floral details. It rest on rectangular cut, staggered legs, and the bench has an opulent finish. It is made with the best, sustainable, solid wood available, and it is 100% customizable.